I didn’t answer immediately. Working in my home office, I haven’t the time or the inclination to spend hours in the kitchen anymore. And neither do busy parents, young couples or working professionals. While everyone wants a traditional High Holiday meal, no one wants to spend a week shopping, chopping, boiling, baking and freezing dish after dish. And these days, there’s really no need for it. Today, with literally thousands of kosher convenience-food items available in markets, it’s easy to create sensational meals with minimum effort. So while you really can’t avoid the shopping, you can skip the other lengthy processes with just a bit of pre-planning and a dollop of shortcuts. Also, the emphasis in contemporary kitchens is on healthier eating patterns. We include more fresh produce in our meals. We’re cooking fish and chicken, rather than red meat — the latter which takes much longer to cook (think of braising a brisket for three to four hours). And consider this: The Jewish New Year falls early in the season — Rosh Hashanah starts at sundown on Sunday, Sept. 9 and lasts through the evening of Tuesday, Sept. 11. Meaning, the weather on both U.S. coasts will be warm. 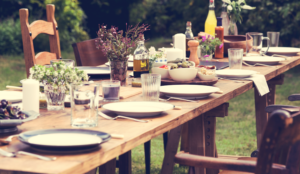 And while wine should be available (Jewish holidays require it), many guests prefer non-alcoholic beverages in what will actually still be late summer as the Jewish calendar changes. Israelis use fresh herbs abundantly. Before filling a water pitcher, insert four to five stems of fresh mint. To top off the entire production, take a seedless watermelon, slice in wedges and arrange on a pretty platter. Or heap clementine oranges in a bowl with mint or rosemary sprigs tucked in. It’s a fresh, sweet and a perfect finale to a simple, yet sensational festive meal. At that Shabbat dinner, I promised to share my “secrets” and recipes with my millennial guests. In return for it, I challenged them to get together and make a Rosh Hashanah dinner. The suggestion was met with downright alarm. Silence snuffed out all conversation. Thankfully — there’s one in every crowd — Cousin George’s face lit up. He turned to May, his wife, and said: “This could be fun.” And so it began . . . a wildly successful Rosh Hashanah dinner to continue for the years ahead hosted by a new generation. So don’t hold back. Check out these recipes. Make all for a complete Rosh Hashanah dinner or bring just one of them to the host of the meal that you’ll be attending. You can also add a round challah, the tradition shape used for the Jewish New Year. No self-rising flour? Use 1 cup all-purpose flour, mixed with 1 ½ teaspoons baking powder and a pinch salt. Fresh herbs: Use any mixture in any quantity. Just trim the tough stems on parsley, mint, dill and basil. Use leaves and stems for best flavor. Depending on size, one bunch, loosely packed, is about 3 to 4 cups. Lemons should be at room temperature. When squeezed, these yield more juice than ones fresh from the fridge. There’s no substitute for the flavor of fresh lemon juice. Refrigerate in covered jar for use within 3 days. Or pour into ice-cube trays and freeze. Pop out a cube to use as needed. Cinnamon-sugar keeps well in a tightly covered container in a cool dry place. Mix 2 tablespoons sugar to 2 teaspoons cinnamon, and add a pinch of nutmeg (optional). Serve sprinkled on breakfast toast, over fresh fruit or on baked desserts. Some items, such as balsamic vinegar, garlic powder, canned tomatoes, canned chickpeas and pumpkin seeds, on the “what to buy” list are good additions to keep on hand. Nuts and seeds may be placed in plastic bags and frozen. Hosting a crowd? No shame in using paper and plastic. Paper plates are pretty and durable, and plastic knives and forks (especially the silver ones) look like the real thing. Flatware can be easily washed for later re-use. For a more formal look, set the dinner table one or two days beforehand and cover loosely with a cloth. Or try trays (you can purchase disposable ones at a party store) and eat picnic-style. Don’t hesitate: Pick up pre-cooked roast or rotisserie chickens, then make it “your own” with a pomegranate sauce (recipe below). It saves time and labor — and you’re assured of perfectly cooked chicken. Choose pre-cut veggies and fruit from the market, canned tomatoes and anything that will make life easier. Remember, pre-cut produce, especially if it’s organic, should be refrigerated and used within 2 days. Items you may have on hand: flour, sugar, baking powder, bread, honey, olive oil, pareve margarine, cinnamon. A slice of multigrain bread gives this a gentle, nutty texture. If preferred, substitute challah. Unpeeled cucumber slices for garnish (optional). In blender or food processor, place all ingredients except salt, pepper and basil. Whirl 15 to 20 seconds at high for a desired texture. Pour into a bowl. Season to taste with salt and pepper. Shred the basil with scissors and stir in. Refrigerate overnight. To serve: Pour into small glasses. Float 2 thin slices of cucumber on top (optional). *May substitute 1½ cups vegetable juice with ½ teaspoon each dried basil, dried oregano and fresh ground pepper stirred in. *Double the dressing ingredients. Refrigerate extra to use later as salad dressing or to drizzle over cooked veggies. In a jar with a tight-fitting lid, shake oil, vinegar and mustard to combine. Set aside. Place the green onions, tomatoes, celery and basil in a large serving bowl. Pour mustard dressing over and toss lightly to mix. Season with salt and pepper. Scatter pumpkin seeds over top. Serve chilled. May make a day ahead. Trim parsley stems. Pull leaves off basil and discard stems. Dill may be used without trimming. Rinse well in cold water. Spin dry all herbs in salad spinner. Place in food processor. Pulse to chop coarsely. Transfer to a large bowl. Add the chickpeas and remaining ingredients. Toss gently to mix. Serve at room temperature. Note: May be made the day beforehand; cover and refrigerate. No one will guess this starts with roasted chicken from the kosher section of your market. Place pomegranate juice, apricot preserves, lemon juice, ginger, salt and pepper in small microwave bowl. Heat on “High” for 18 seconds, or until preserves are melted. Check after 10 seconds. Stir to mix. Cool slightly. Arrange chicken in one layer in a baking dish. Pierce each piece 2 times with a fork. Pour the pomegranate mixture over top. Cover tightly with foil. Heat through in preheated oven 20 to 25 minutes. Chicken will steam and absorb flavors. Spray aluminum foil with nonstick vegetable spray. To assemble: On center of 1 sheet of foil, place 1 asparagus spear (2 pieces). Top with a slice of onion, then a salmon fillet. Sprinkle lightly with za’atar. Drizzle a tablespoon of salsa over and then top with a sprig of dill. Bring the long edges of foil up and over the salmon to meet at center. Fold over loosely to create a tight seal. Then fold edges at each side to seal. Place on a baking sheet. Repeat with remaining ingredients. May be refrigerated 4 to 6 hours before cooking. Bake in a preheated 450-degree oven for 18 to 20 minutes, depending on thickness of salmon fillet. A 1-inch fillet will need closer to 20 minutes. *A lively Middle Eastern spice blend of thyme, sesame and sumac. Also add to olive oil for dipping. It’s now available in many supermarkets, especially in the kosher section. **May substitute a tomato/vegetable salsa. Couscous is not a grain. It’s a pasta made from semolina flour, which is extremely high in gluten. Prepare couscous according to package direction. Stir in currants. Cover and set aside to keep warm. Whisk together the olive oil, lemon juice, cumin or turmeric, salt and pepper. Stir in ¼ cup mint. Set aside. In a large saucepan, cover carrots with boiling water. Bring to boil and cook for 10 minutes, or until fork-tender. Drain well. Transfer to a serving bowl. Pour olive-oil mixture over and stir gently to mix. Spoon the carrots over the couscous. Sprinkle remaining mint over to garnish. Serve warm. *May be prepared a few hours ahead of time. Cover loosely with plastic wrap. Reheat in microwave for 2 to 3 minutes, or until warm. Sprinkle mint over just before serving. From my late husband’s grandmother’s kitchen. She used fresh blueberries, but in September, I use frozen or little blue Italian plums, stones removed and quartered. In a large saucepan of boiling water, cook noodles until tender but still firm (5 to 7 minutes). Drain in a colander. Meanwhile, in a medium saucepan, stir together the sugar, lemon juice, blueberries and 3 tablespoons water. Stir over medium heat to dissolve sugar and bring to a boil, about 5 minutes. In a large serving bowl, toss the noodles with the margarine and cinnamon-sugar. Pour the blueberry mixture over top and serve hot. Note: Blueberry sauce may be made ahead of time and heated when needed. Prepare, bake and serve in a single dish. No bowls to wash.
Preheat oven to 350 degrees. Core and quarter apples. Do not peel. Cut into wedges about one-quarter-inch thick. Set aside. In an ovenproof dish, 11×7 inches, place margarine. Set in microwave to melt, 30 to 40 seconds, depending on microwave wattage. To the melted margarine add flour, sugar, nondairy creamer, water and orange extract. Stir to blend. Scatter apple wedges and walnuts over top, making sure to cover the batter. Do not stir. Drizzle with honey. Bake in preheated oven 45 to 50 minutes, or until nicely browned and bubbly at edges. Serve warm or at room temperature.